Have you ever been sitting here, reading this blog, and wondered to yourself, “Ian is a genius and all, but what am I getting out of this?” Well, now you can finally get something for you loyalty. 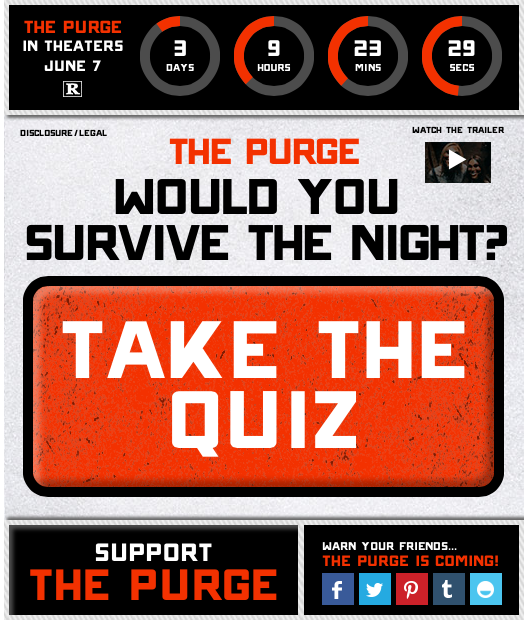 The friendly people at Universal Pictures have provided me with “The Purge” App, for their upcoming feature “The Purge” (which, in my honest opinion, looks awesome), coming out on Friday, June 7. You can play this app, or not, but I have also been bestowed the power of giving one reader a “Purge” prize pack. This prize pack includes free t-shirts. You heard me right. Free t-shirts. How often in your life do you get the chance for free t-shirts? From a real movie studio? Let me know if you’re interested. Keep on Reel Dealin’ on. This entry was posted in Uncategorized on June 5, 2013 by ian0592. T-shirt me, Ian Phillips. XXL all around.